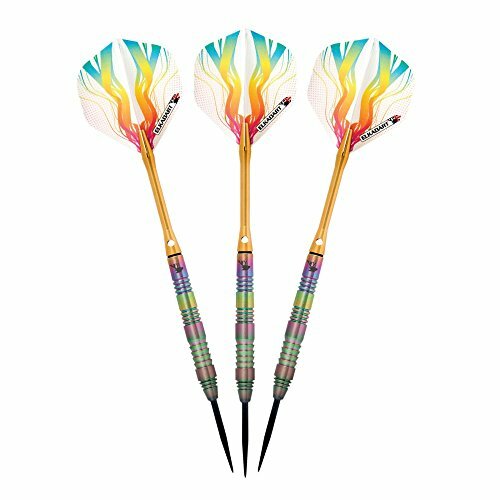 The Elkadart Rainbow steel tip darts are designed with high quality, 90% tungsten and 10% nickel barrels with a rainbow finish, offering exceptional balance and styling. Using a dense metal like tungsten creates a slim profile dart barrel compared to a dart without tungsten. The higher the percentage of tungsten used, the smaller the profile, allowing for a closer grouping of darts to maximize scoring. Intended for use with sisal/bristle dartboards and is ideal for intermediate-to-advanced level players. Each barrel has strategically placed knurled bands, deep grooves and rings that make excellent gripping points and encourages consistent hand placement. Elkadart Rainbow darts are equipped with heavy-duty, lightweight aluminum shafts with locking holes. Locking holes in the shaft allow for a tighter fitting to the barrel that improves stability and greatly reduces the need to retighten during play. Quality flights are constructed to help increase speed and reduce drag, delivering a consistent flight path for pinpoint accuracy; detailed graphics are prominently displayed for added flare. The Elkadart Rainbow darts are fashionably stored and protected in the slim-profile, hard-shell case. Proudly designed, manufactured, assembled and packaged in England. If you have any questions about this product by Elkadart, contact us by completing and submitting the form below. If you are looking for a specif part number, please include it with your message.